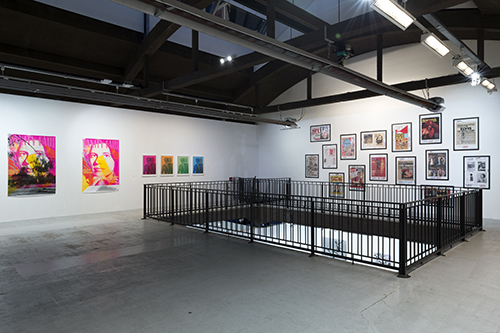 With the works of : Saâdane Afif, Pierre-Olivier Arnaud, Elena Bajo, Mirtha Dermisache, documentation céline duval, Sophie Dubosc, Jean-Jacques Dumont, Michel François, Gilles Furtwängler, Ryan Gander*, Gavillet & Rust, Julien Gobled, Felix Gonzalez Torres, Rodney Graham*, Guerrilla Girls, Ben Kinmont, François Kohler, Laurent Lacotte, Pierre Leguillon*, Claude Lévêque, M/M, Jonathan Monk & Maurizio Nannucci*, Pierre Paulin*, Henrik Plenge Jakobsen*, Lili Reynaud Dewar*, Marie Reinert, Delphine Reist, Michael Riedel, Allen Ruppersberg*, Yann Sérandour, Laurent Sfar, Sidney Stucki, Superflex*, Raphaël Zarka. 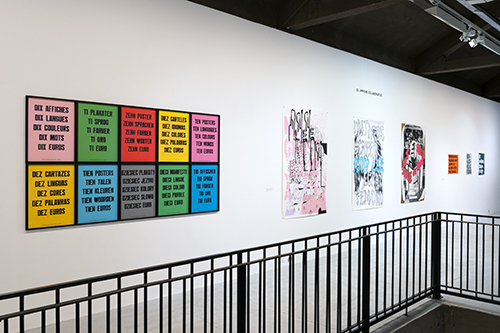 The frac Normandie Rouen choses to focus on a medium newly integrated in its collection: artist placard and/or poster, condensed under the english name Posters. 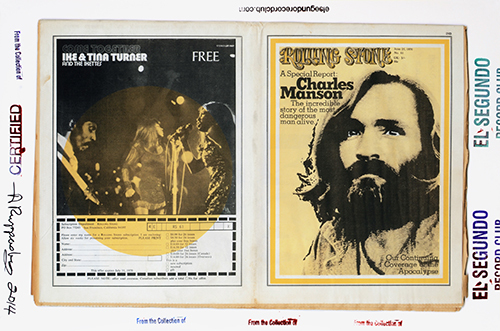 Whereas it tends to loose some ground amongst graphic designers, increasingly, certain artists appear to be devoting particular attention to this medium. 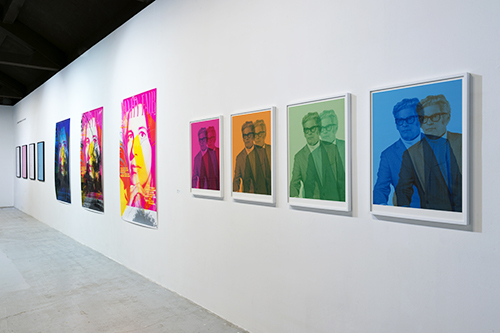 À droite : Rodney Graham, Ensemble de 4 posters Canadian Humourist (pink, orange, green, blue), 2012, Collection frac île-de-france © Rodney Graham. Exposition Posters, Frac Normandie Rouen, 2017. Photo © Marc Domage. 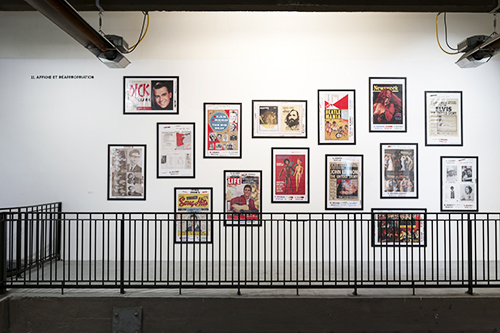 Allen Ruppersberg, Ensemble de 15 posters El Segundo Record Club, 2014, Collection frac île-de-france © Allen Ruppersberg. 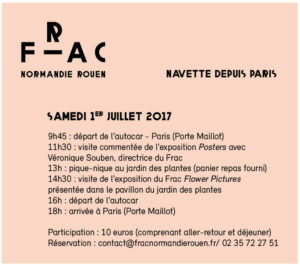 Exposition Posters, Frac Normandie Rouen, 2017. Photo © Marc Domage. Jonathan Monk, Ten Posters Ten Languages Ten Colours Ten Words Ten Euros, 2011, Collection frac île-de-france © Jonathan Monk. Exposition Posters, Frac Normandie Rouen, 2017. Photo © Marc Domage. 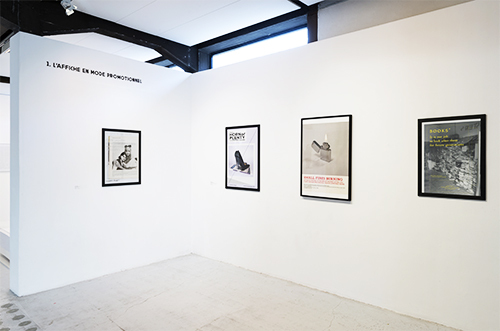 Vue de l’exposition Posters, Frac Normandie Rouen, 2017. Photo © Marc Domage. , 2011, Collection frac île-de-france © Jonathan Monk. Exposition Posters, Frac Normandie Rouen, 2017. Photo © Marc Domage.